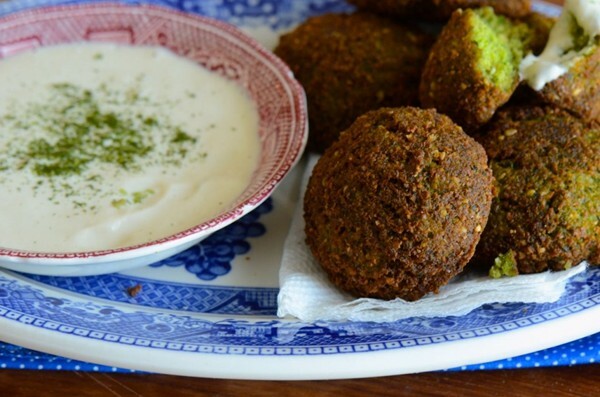 I have been preparing family meals since I was ten years old, and I have to admit, it has taken me a full 45 years to try my hand at falafels. Now there is no turning back because these are just incredible and the family is hooked. I was pleasantly surprised to find they were much simpler to prepare than expected. It’s not often I can cite Bon Appetite for a whole food plant-based recipe but here you go, in their October issue, Fresh Herb Falafel. You will see in the instructions that this recipe calls for deep frying which just isn’t a method I can endorse. I can, however, tell you that cooking the falafel balls in a small amount of olive oil in a non stick pan works quite well. Additionally the balls can be flattened into small patties and baked for 30-40 mins, flipping each patty after 15-20 minutes. I can also highly recommend this Spiced Green Tahini Sauce that is mentioned in the same article. We enjoyed the leftover sauce leftovers on roasted potatoes the following day. While I opted to serve ours on their own with a large kale salad, you may want to test out this gluten and dairy free pita recipe. Although baked goods are not considered whole foods, when following an 80/20 plant based diet (80% whole food plant based & 20% processed foods) it certainly qualifies as part of your twenty percent.